15� Robbie Phillips with 7 regular tree. Dark rough out with cream buckstitch. 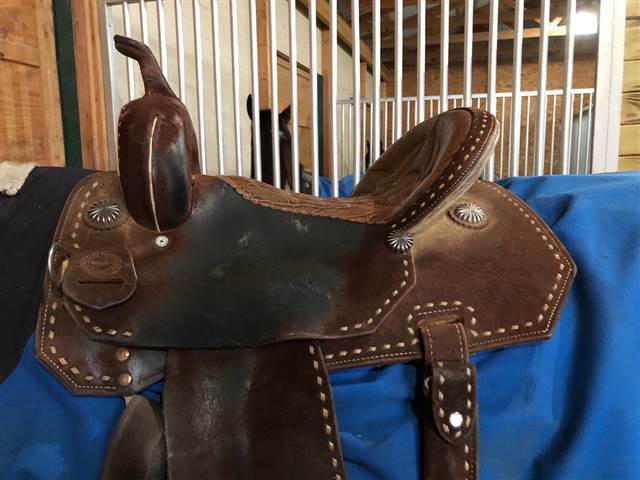 Saddle is in very good condition. I�ve used it mostly for competition and not much regular riding. Sold the horse I used it on. The Nettles stirrups on saddle not included (last picture is stirrups that go with saddle). Shipping to lower 48 included. 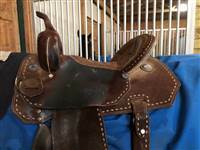 I would sell the lightly used 28� 5star 1 inch dark brown pad with brown/turquoise Navajo leather I use with it for additional $150 (reg $300). Together it looks really sharp.